ADDERLink XD522 (XD522-DP-PAIR) is a high performance Dual-monitor DisplayPort KVM (Keyboard, Video, Mouse) extender that enables you to locate your critical computing hardware in a secure and temperature controlled environment away from the user work station whilst maintaining the same user desktop experience. The XD522 can transmit one 4K @30Hz, or 2560x1600 at HDR10 video stream to a single monitor or two 1920x1200 video streams to two monitors. Also supports DisplayPort audio, digital audio (S/PDIF), analog audio, Hi-Speed USB 2.0 and USB 2.0 (full and low speed) over CATx cable. The XD522 system is uncompressed, where by every pixel of every frame are sent without loss. The receiver supports DisplayPort Dual Mode (DP++) which means that monitors which only support HDMI or DVI can be used (with the correct adapter cable). XD522 can extend either two 1920 x 1200 screens or a single high resolution screen to 2560 x 1600. The single screen configuration supports High-Dynamic-Range (HDR10) up to 2560 x 1600 @60Hz 10bit per color. The XD522 system delivers analog stereo audio (Line in, Line out) & supports microphone input & headphones. It also delivers S/PDIF (optical input) via a 3.5mm jack line in connector (mini Toslink). The DisplayPort digital audio path can have up to eight channels of 24-bit 192 kHz uncompressed "Pulsecode modulation" PCM audio or can encapsulate compressed audio formats in the audio stream. Supported compressed formats: DRA, Dolby MAT, DTS HD. The remote unit has an built-in 6-port USB hub to enable several USB devices to be connected. HID devices are supported on ports marked "A" and isochronous devices (i.e. USB audio or video devices) on the Hi-Speed link only marked "B". 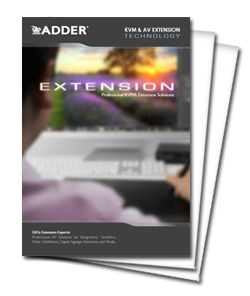 The XD522 extender has an intelligent EDID management to allow the true characteristics of the monitor to be passed back to the computer. The AdderLink XD522 extender is delivered in a zero config state so you can plug in the units and start working with them straight away. There is no need for drivers or software to be installed. AdderLink XD522 units can be mounted on rack (RMK4S: 1 unit in 1U, or RMK4D-R2: 2 units side-by-side in 1U), desktop, wall mounted (RMKV4) or attached to the back of your monitor using an optional VESA mounting carriage (RMKV4). Adder Technology have a well-earned reputation for creating products that perform well and stay the course. AdderLink XD522 is no exception and features tough enclosure with internal components and external connectors that can an easily withstand environmental pressures. Minimum of 50,000 hours Mean-Time-Between-Failure (MTBF) based on 100% PSU load. Actual PSU load does not exceed 66%. Note: Distances are achieved using single lengths of trunk/bulk cable with two 3 meter CAT7a patch cables. For each additional break/patch connection reduce distance by 5 meters. Preferably patch cables should be of type CAT7a and less than 2 meters. Patch cables over 2 meters must be CAT7a. DisplayPort interface Resolutions to a maximum of 3840 x 2160 on a single screen or 1920 x1200 on two screens. The receiver unit supports DisplayPort Dual Mode (DP++) also. DPCP and HDCP are not supported. USB 2.0 Supports up to six USB 2.0 devices (low or full speed). The system does not allow non-HID devices on ports marked 'A'. Isochronous devices are supported (i.e. USB audio or video devices) on the Hi-Speed link only marked 'B'. Digital stereo audio The system delivers analog stereo audio (Line in, Line out) and supports microphone input and headphones. It also delivers S/PDIF (optical input) via a 3.5mm jack line in connector (mini Toslink). RS232 RS232 can be passed between the units to a maximum baud rate of 115K2 via the options port. Hardware All computers with DisplayPort, USB, audio, RS232 - requirement dependent. O/S All known software and operating systems including: Windows (all), DOS, Linux, Unix, BSD, Sun OS, Solaris, Mac OS, NetWare etc. XD522 is also known as the XD522-DP-PAIR, XD-522-DP-PAIR, XD522-DP-PAIR-US, and XD522-DP-PAIR-USA. Question: It looks like I can run two different computers through this single box. Answer: Thank you for your inquiry. The Adder XD522 has two DP connections for dual screen purpose. The 2 x USB for Keyboard/Mouse only supports one machine, therefore if you had two machines, one on each video feed, only one machine would be able to have control, the other being static video. In your case, you would need a 2-port extender, also available with dual monitor capabilities. Question: Is it possible to connect MAC Thunderbolt interface via ADDERLink XD522? It is indeed - The ADDERLink XD522 was designed ground-up for high performance support of Mac Thunderbolt (and Mac Cinema Displays) at native Mac resolution (2560 x 1440). All Mac Thunderbolt ports with DisplayPort, Mini-DisplayPort, or USB-C connectors (Thunderbolt 1, 2, and 3, respectively) also support the XD522 Dual-Mode DisplayPort (DP ++) feature. This means that you can also use monitors which only support HDMI or DVI, with your Mac Thunderbolt interface, through the Adder XD522 (using the correct adapter or cable). Note, the optional adapter needs to support at least DP 1.2 standard. - To use a Thunderbolt 1 Mac (DP connectors) with XD522: Thunderbolt 1 is backwards compatible with DisplayPort; you can simply plug in the Mac to the XD522. - To use a Thunderbolt 2 Mac (mDP connectors) with XD522: you can simply use a Mini-DisplayPort to DisplayPort adapter or cable. - To use a Thunderbolt 3 Mac (USB-C connectors) with XD522: Please contact us for the ideal adapter. Also note, as of today (April 6th, 2017), the XD522 does not currently support DisplayPort MST (Multi-Stream-Transport) for chaining multiple monitors together. Standard Dual Monitor is still supported using the (2) built-in DP video ports. To read more general information about the Thunderbolt standard, about Thunderbolt adapters and cables, how to optimize Thunderbolt performance, etc see: Apple - About Thunderbolt ports and displays. 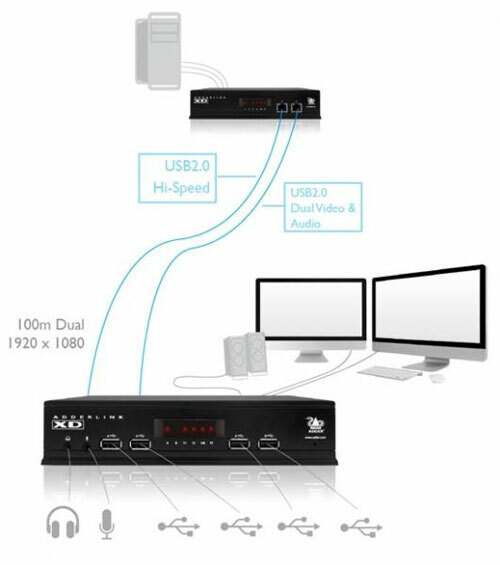 Question: Hello, is it possible to connect 2 Extenders, to get the application of 1 Server, 2 Extender and 4 Monitors? You could indeed use 2x Adder XD522 to extend quad-monitor DisplayPort from 1 server. Keep in mind, to get regular multi-monitor control, your server will need 4x DisplayPort outputs. If you would like to mirror one or more server outputs to multiple monitors, you can use DisplayPort Splitter(s) in combination with the Adder XD522 extender(s). The total video bandwidth supported by this device is 308 MegaPixels per second (Mpix/sec). The Max bandwidth for Video port 1 can be up to 280 Mpix/sec, while port 2 can use a maximum of 154 MPix/sec (subject to port 1 using no more than 154 MPix/sec of the available total bandwidth). The bandwidth requirement for 2560x1440@60Hz as reported by Adder is 242Mpix/Sec. So, unfortunately it does not appear this device would support two screens with a resolution of 2560 x 1440. For two monitors, it appears the highest resolution is 2048x1080@60Hz. You can read more about the max resolutions supported in the PDF Manuel linked here: http://42u.com/pdf/Manual_XD522_Adder_v1-0c.pdf. Please feel free to contact your KVM Switches Online representative at 1-877-586-6654 or via our online chat feature to discuss your project in greater detail.